7 year ago a film dropped on my radar called Blik. It instantly became, and still remains, one of my favorite student animations. A relatively modest story of a young boy’s fascination with the older girl-next-door, the film possesses real heart—tapping beautifully into a relatable sense of adolescent melancholy, Bastiaan Schravendeel and a team of animators out of the Utrecht School of Arts built a gorgeously-designed, yet naturalistic, world for its characters to inhabit, filled with life-like performances. That they chose to omit faces from their characters felt subversively bold, and yet the decision only better served to exhibit the preternatural sensitivity of the team towards the subtle details of movement and gesture. At the forefront of the then new-ish trend of applying 2D animation aesthetics to 3D models, such a debut presaged great things to come, and the team promptly incorporated as a new studio—Polder Animation. 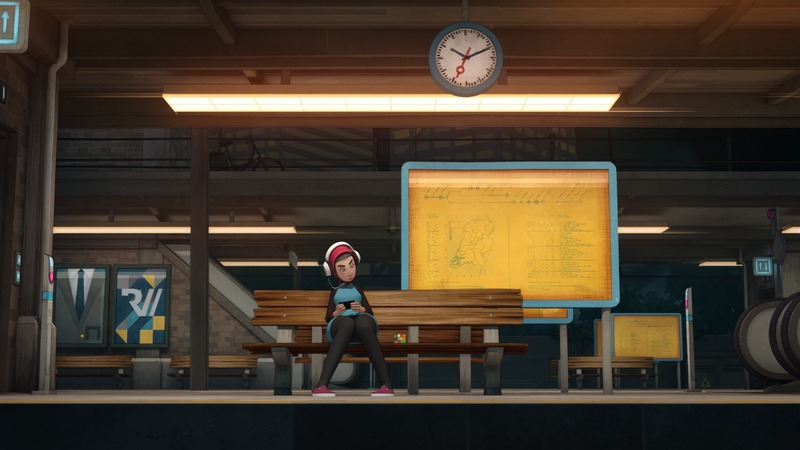 In the years that followed, they’ve found steady work in 3D animation: TV, video game, and commercial projects are included in their portfolio, and now with Scrambled they’ve returned to short film to show us all they’ve learned. Scrambled is the story of a girl, Esra, waiting for a train whom is approached by a sentient Rubik’s cube. Fantastical premise aside, this oddity is not played for laughs or shocks, and the story is, like Blik, small and contained, verging on slight, yet undeniably relatable—a slice-of-life observation of humanity, polished and isolated. While the underlying themes of analog versus digital, and technological backlash are present, they are not overwrought, and the simplicity of the cube, wanting nothing more than to fulfill its purpose and be solved, is immensely pleasing. While the film is less emotionally compelling than Blik, it is also (as to be expected) a huge step forward visually. That statement however does little to emphasize just what a treat the film is to look at. Gorgeously colored, the design is, perhaps a bit more conventional, abandoning the distinctive low poly aesthetics of previous work, but still retaining a signature Polder style, with anachronistic hand-details and textures figuring into every frame via a brand new, built from the ground up, line generator. There is a wonderful depth to the backgrounds that feels like it should be in tension with the relatively clean design, and yet somehow that complexity is blended perfectly so that Esra never feels out of place in the environment. Where the art really shines is in that old sense of movement and gesture. The practical execution of the cube’s agency is nothing short of genius. Schravendeel shared with us that “The biggest challenge was to create a genuinely believable, likable and relatable character from a Rubik’s cube without making it about anything other than it being a Rubik’s cube. I’ve always liked films that manage to evoke emotion and personality from objects that usually don’t have any, especially if it can be done without dialogue.” The trick was to maintain the functional nature of the cube, and stay true to its identity, while developing its personality as a character. That Schravendeel and his team pulled this off is quite an accomplishment, and testament to their skill and ingenuity as animators and not just designers. Premiering this week online after a stellar festival run that included SIGGRAPH, TIFF Kids, and Klik Animation, it would be a shame if we have to wait several more years for a short film followup from Polder. According Schravendeel though, we have nothing to fear—while Polder Animation recently completed development and production work on a 3D animated TV series, they are also currently working on the development of two brand new short films.